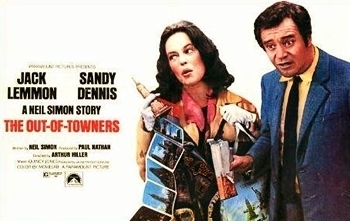 Dear Heart was introduced in The Out-of-Towners, a 1970 comedy film written by Neil Simon, directed by Arthur Hiller, and starring Jack Lemmon and Sandy Dennis. It was released by Paramount Pictures on May 28, 1970. Much of the film’s humor is derived from the interaction between George, the manic husband desperately collecting the names of everyone he encounters with plans to sue every last one of them, and Gwen, the mousy wife who accepts each new indignity with quiet resignation. A number of comic actors, including Anne Meara, Sandy Baron, Ann Prentiss, Paul Dooley, and Anthony Holland, were cast in small supporting roles.